Banks's book is similar to a playlist on your favorite CD as each chapter has a theme that strategically connects with the next chapter using interludes. His playlist tells a story that hinges on African American rhetoric's fluidity as well as its purpose driven and firmly planted history. 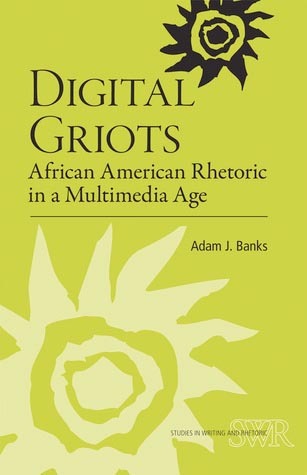 Banks's preface, titled "Scratch: Two Turntables and a Storytelling Tradition," articulates his purpose by noting that Digital Griots will "play in the grooves of two messages – disciplinary conversations about African American rhetoric and those about multimedia writing" (2). He asks readers to pause, to "scratch," to stop and to think about what can be gleaned from seeing the DJ as a griot in the composition classroom, in the community, and in digital spaces. Through Banks's "scratch" we see how he uses the DJ as a rhetorical trope to understand just how print, digital, and oral traditions are intertwined and should be looked to in order to create culturally aware and responsible communities that "play in the grooves" (2).